The perfect combination of magic, mentalism and fun audience interaction as the volunteer tries to guess the combination on the padlock. After all, their ring is locked onto it. The wonderful twist at the end comes when the volunteer realises they've known the four digit code all the time. It's the year of their wedding! Lots of fun with a volunteer on stage at a school assembly or church service. Great as a close up trick with a youth group, or at a party. This 3 inch brass padlock packs small but plays HUGE! A wedding ring is borrowed and is threaded onto a padlock. The volunteer is asked to spin the wheels so the padlock is locked. Now the fun starts. The performer realises that he's lost the combination! The lock is passed round audience members who all try unsuccessfully to open the lock. Different ideas are tried. The current year. Someones PIN number! Looks like the volunteer is going home with a free padlock...locked to his ring! The performer has an idea. He asks the volunteer what year they were married. It opens the lock! Whoa! The ring is safely returned and the performer takes their well earned applause. Velvet drawstring bag included - the perfect combination! Any four numbers can be set to open the padlock - and you don't need to know the number before hand. So you're incredible flexibility in terms of presentation. It could be someones birth year, their parents birth year, a wedding anniversary, even the first four numbers of their mobile phone number! Fun escapology presentation. Chain a volunteer to a chair and watch everyone's faces when you realise you've forgotten the combination! Illustrate dozens of different stories by creating the four digit number from the chapter and verse of the text you are preaching from. For example ,the story of the imprisonment of Paul and Silas can be found in Acts 16. Ask someone pick a verse, any verse e.g verse 26 which describes the earth quake, and miraculously that combination 1626 opens the padlock! Professional magic that's so easy to perform. BONUS: We include a velvet bag to keep your very special padlock in. A very versatile prop that you'll be able to use in dozens of different situations. Great interactive fun in a church service, school assembly or party. 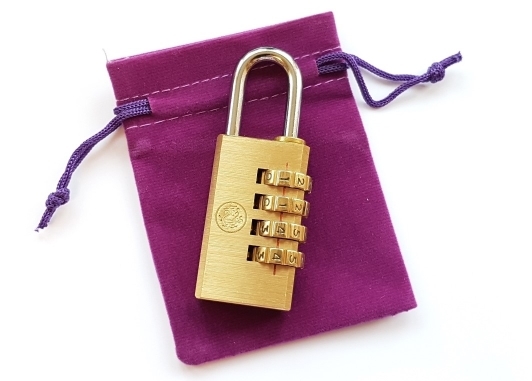 You will receive: A very special brass padlock (3 inches long) with our exclusive instructions. NEW - The Impossible Die - Sealed in a box, unable to turn, the die magically reveals the chosen number. Completely baffling. Fully examinable. SPECIAL - Change Bags - Make objects appear or change then do it again! The 1 prop every magician needs!